It’s summer holiday time and I’ve been planning lots of fun things to do with my kids. Recently, having discovered it was celebrating its second birthday with a 50% off sale, I got carried away on the Tattly website and so we’re going to spend the summer covered in fake tattoos. I remember when temporary tattoos were things that used to be included in the wrapping of mysterious tasting bubble gum. Remember that stuff? Tasted a bit like Germolene. Horrible and yet oddly nostalgic. And the tattoos themselves were awful. However, Tattlys are so utterly brilliant, I’ve felt the need to try them out myself before letting the kids loose on them. And I bought a couple specifically for me … well, why not? The company was founded by Tina Roth Eisenberg, aka Swissmiss, who realised that all the temporary tattoos that her daughter wanted to wear were rubbish and so decided to create some better ones. What a great business story – I love start-up stories like this! 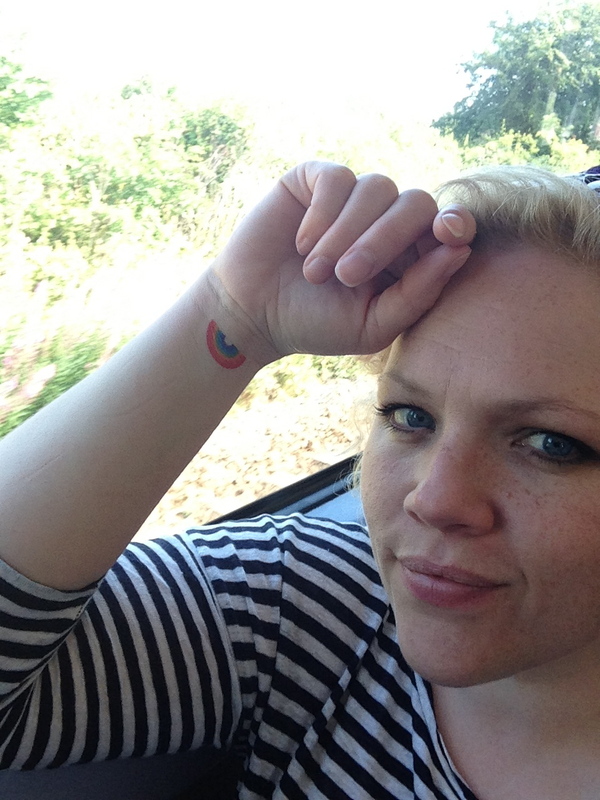 Me (on the train) with a mini rainbow Tattly! I chose the watch collection, the rainbow collection, and some polaroid cameras. But in all honesty, I could have carried on and on, because the designs are just awesome. The designs are really varied, mostly bright and colourful (and there are some that are just simple black text) and loads of fun. We’ve tried a watch and one of the rainbows so far and they were really easy to apply, and stayed on the skin for a good few days before gradually wearing away. Expect to see more blog posts and Instagram photos of us wearing them, because I love them and I know that my kids will too!